Saturday dawned bright and sunny but cold - but undeterred we were going to put Friday's postponed plan into action and catch the tram into Alicante to do some exploring. So our first stop was the tram station which was only a quick 10 minute walk down to the sea front promenade and then all that was required was for us to cough up our 1.45 euro fare before we were whisked away to our destination. Alicante is the capital of eastern Spain's Costa Blanca holiday region - and even though it's still the middle of 'winter' the town was buzzing and busy - so goodness knows what it must be like in the height of summer! We alighted from the tram about 11.30 am, and initially headed for the market but that proved to be mostly stalls selling all manner of fresh food, and although much of it looked quite tempting we didn't buy anything because we didn't want to carry it round with us! You would have loved it Louise! Next on our agenda was the lesser known of Alicante's 2 castles - The Castle of San Fernando which was built around the time of the War of Independence (1808 - 1814), but to be honest, we were a bit disappointed with what we found. The Castle stands proudly high up on Mount Tossa but the way we chose to approach was through narrow tatty residential streets, and when we got to the top of the hill what remained of the fortress was daubed with graffiti and was home to multiple communication masts. 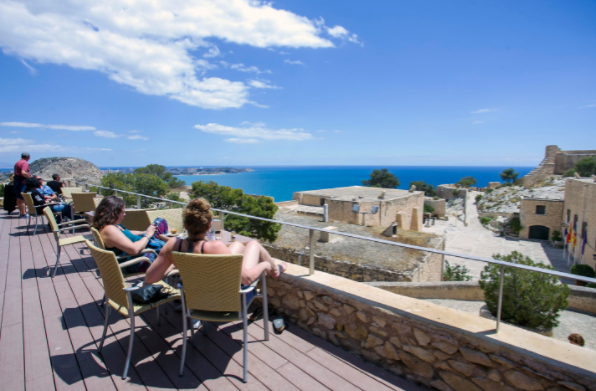 However, it's ramparts did afford us magnificent far reaching views, not only of the city and coast, but also of Alicante's other more well known castle - Santa Barbara - and also of the hills and snow capped mountains that form the City's backdrop. .......and then proceeded towards the coast along a pedestrianised walkway that kicked us out offering fantastic views of the marina and palm tree clad promenade where a good many folk of multiple nationalities were relaxing and watching the world go by. We joined them for a short time while we sipped our coffee, but then nipped off to find the lift (2.70 euros) which would elevate us without effort to the lofty position of Santa Barbara Castle which sits atop Mount Benacantil - and this required us to pass through a long metal clad tunnel that seemed as if it might be taking us to the dungeons! But it didn't - and when we effortlessly arrived on the monument's doorstep we found much more to keep us entertained! 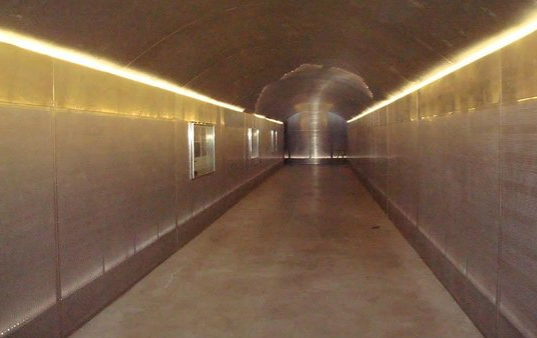 The fortress has medieval Arab origins and offers tunnels, stairwells, walkways, hidden nooks and crannies and loads more battlements with extensive 360 degree panoramic views. Then, in addition to all that we discovered the Cafe Monte Tossal - a glass fronted bistro with a lovely veranda that overlooked the coast and which offered drinks and simple pasta/pizza lunches for a fee that didn't have multiple zeros attached to it! So as you would imagine we took absolutely no persuading to sit and sip cold vino blanco while we enjoyed meat filled ravioli, stunning views and a bit more sunshine! 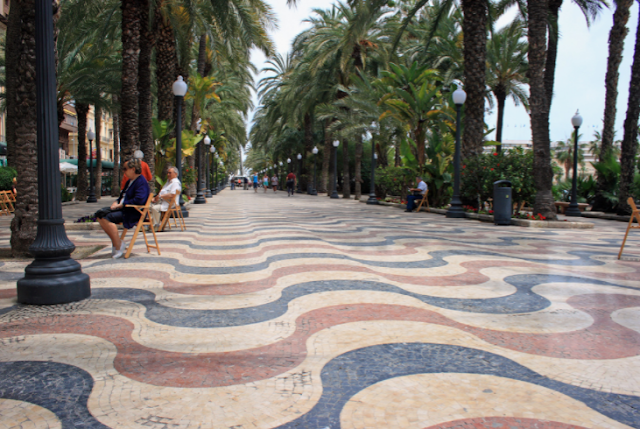 We eventually tore ourselves away and followed a path that led steeply back down to the sea front, but before we enjoyed that again we took a walk along Alicante's refined marble promenade where the wavy lines made you feel as if you'd indulged in more than one glass of intoxicating beverage! We strolled beneath the old palms with a good many others, and if we hadn't just eaten there was more than one eatery that would have tempted us along it's way. Eventually, the marble undulations brought us back to the sea front where once again we were stopped in our tracks to admire the views - but by now the cool breeze was making us feel quite shivery so after a short while we nipped back to the tram station for our journey home! Sunday - well that was another treat - in the form of a full English Sunday Roast at the sea front sport's bar we'd visited earlier in the week. We enjoyed roast beef and pork, stuffing, pigs in blankets, roast potatoes, Yorkshire puds and loads of veg - and John even squeezed in apple pie and custard - so as you would imagine, by the time we'd eaten that lot we didn't do much else other than stroll the couple of miles home and put our feet up for the rest of the afternoon! And even tea was easy cos mostly we didn't want any! Monday - well I'm not going to waste much ink on that because all we did was a bit of shopping, a bit of washing, a bit of cleaning and a bit more coastal walking - but it was quite nice just to have a quiet day! Tuesday saw us off out on another marathon - or maybe it was just a half! We caught the tram back into Alicante and then walked the 10+ miles home! And why was it 10+ - well, at one point we missed our way and ended up wandering about a mile down an almost deserted coastal road that turned out to be a dead end - so with no other way to choose (unless we wanted to swim for it) we had no choice other than to retrace our steps! However, I'm not complaining because part of our excursion took us through a natural park where the coastal views along with the wind and wave eroded sculptures were stunning! The Overhang in front of John is just held up by fresh air! And then while we rested and finshed our picnic we were entertained by another fisherman - but he didn't seem to be able to catch anything! So that brings us up-to-date and to today - Wednesday - and our last day on this site! 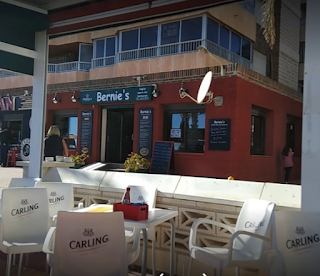 After yesterdays exhursions we'd decided not to over do it today, therefore all we'd got planned was a 2 mile stroll into El Campello to partake of a steak lunch at an Italian reasturant we'd spotted on one of our previous jaunts. However, our plans were foiled because when we got there they were very firmly shut - as were quite a few of the other eating establishments along the sea front! But by this time we were starving, so we had no alternative but to return to the watering hole that had already fed us extremely well on 2 previous occasions while we've been here! Bernie's - It's really not very Spanish and mostly only serves good old English fodder - but it does this very well and usually there are quite a few of our fellow countrymen to chat to - thus making it a very convivial venue! Once again we weren't disappointed - John enjoyed steak pie and chips while I couldn't resist their fish and chips! And what made it even more enjoyable? Well that would be the pleasure of being able to eat outside in warm sunshine while watching the Med's waves wash up onto the sandy beach! Anyway, I'm going to say cheerio for now as I want to get on and finish my book!